Custom superyacht manufacturer Oceano debuted its one-of-a-kind ‘Tuhura’ vessel at this year’s Dubai International Boat Show. 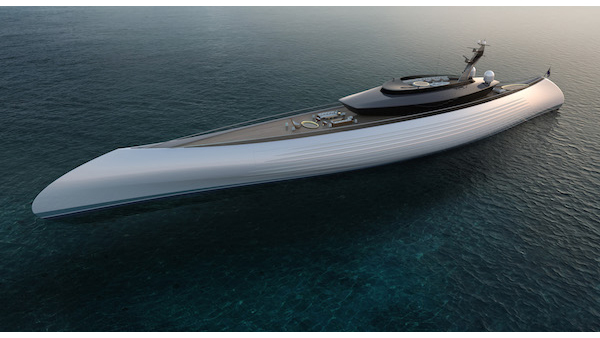 The 115-meter-long megayacht was made in collaboration with Lobanov Design studio, BMT Nigel Gee and interior designer Achille Salvagni. Canoes, dugouts, and other vessels from ancient times inspired its elegant design. Its name, ‘Tuhura’, was derived from the definition of the Maori verb, which means to explore, bring to light, discover and delve deeper into something. The hull’s simplistic canoe-inspired design results in greater efficiency, lower overall resistance, and enhanced mobility. It utilizes a hybrid Azipod® contra-rotating (CRP) propulsion system developed by ABB that’s better suited for its canoe form. The numerous horizontal windows at the hull are made of advanced glass technology comprising a series of dots. This enables transparent views from within. From the exterior, however, the windows appear the same color as the hull, thus disguising their façade. See how the interiors of ‘Tuhura’ look like via the Instagram album below.